On November 28-30, the Joint Revenue Committee is meeting here in Cheyenne. On their agenda is a little item called "Taxation of Corporations", which means that they are going to continue to talk about how to create either a gross receipts tax or, in follow-up of their September meeting, a corporate income tax. At this point, we do not have enough information to formulate the impact of a corporate income tax on the Wyoming economy, but since the Revenue Committee is continuing its conversation about taxing corporations (in addition to already existing sales, use, property and severance taxes), it is important that we build an independent understanding of what it means to tax corporations at the state level. For starters, the Revenue Committee has a choice between a corporate income tax and a gross receipts tax. Theoretically, there are other choices, such as higher taxes on commercial property and other taxes on business transactions. In practice, though, the only way that the Revenue committee is going to expand taxation as it wants to, is if it goes for either a tax on gross receipts or on C-corporation income. Since they discussed, and dismissed, a gross receipts tax last year, it is logical that they did not bring it back this year at the top of their agenda. From a tactical viewpoint, it makes more sense to start off this legislative season with a more serious tax topic: a corporate income tax. By topping its tax agenda with that tax, the committee is in a better position to bargain for the return of a gross receipts tax, should resistance to a corporate income tax be too much to overcome. States with grey columns have a corporate income tax and only a partial tax on personal income (limited to equity-based income). States with red columns have a corporate income tax but no personal income tax. 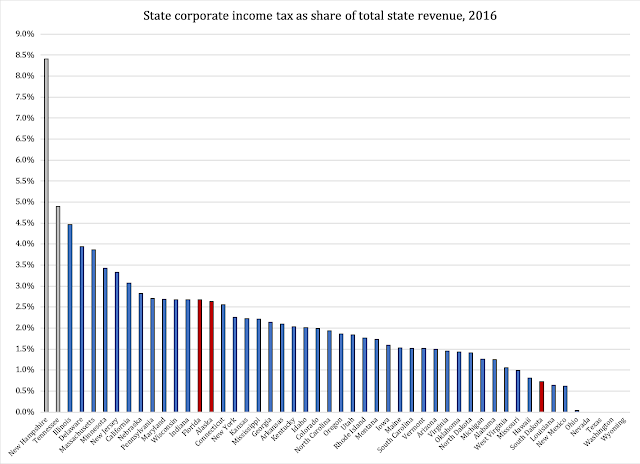 Before we continue, as the astute reader will notice, there is an oddity in Figure 1: South Dakota does not have a corporate income tax, yet in the 2016 data (I have not had time to review it for other years) there is a small stream of revenue documented as "corporate income tax". I have sent an email to the South Dakota Department of Revenue to inquire about this. On average, our neighbors collect 2.1 percent of their total revenue from the corporate income tax. Theoretically, our legislature could pass a corporate income tax at four percent and still point to higher rates in neighboring states. That would be a moot point, of course, as a corporate income tax here in Wyoming would reduce the difference to neighboring states from the full percentage in those states, to the difference between their rate and ours. Is a new tax on corporate income going to be an isolated reform, or part of a "tax base reform"? Hopefully, the committee meeting will bring answers to both these questions.